This late 1960s-early 1970s military spec Sylvania 12AX7WA tube has long gray plates with copper grid posts and a halo getter. The green or blue print on the glass reads "JAN 12AX7WA" (labels may be partial) and 12AX7WA is etched in the glass. See product options for current availability. Tube ships in its original box or in a new white box with test results for current draw (mA) and transconductance (Gm). This tube is sold individually. Photo is a sample from the lot. Matched pairs, when available, are listed as Item 626. 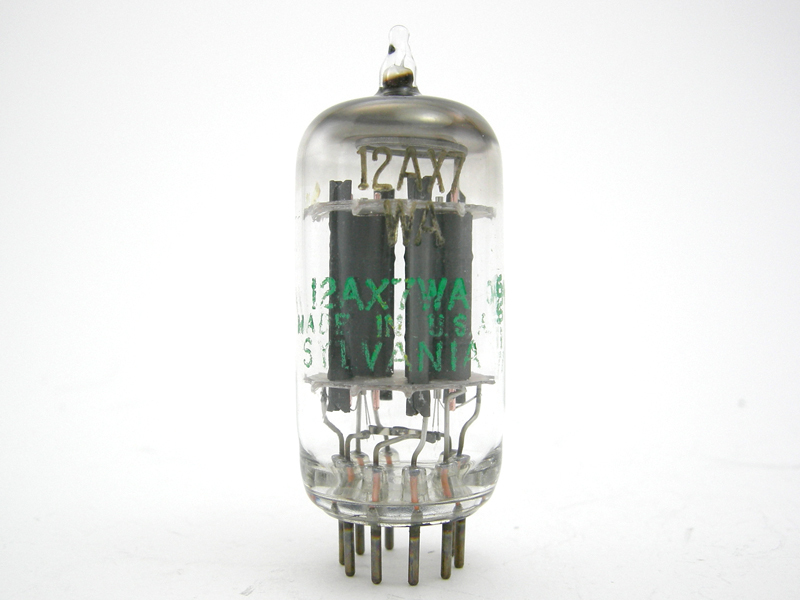 This late 1950s-early 1960s Sylvania 12AX7 tube has long gray plates with copper grid posts and a halo or D getter. The yellow or green print on the glass has the Sylvania logo (label may be partial or missing). Click "more info" for current availability.